Power the fun stuff or cover an emergency with a GP Series portable generator. Affordable reliability and features not usually found on basic portable models make these a favorite for home use, camping jobsites or outdoor events. Power the fun stuff or cover an emergency with a GP Series portable generator. 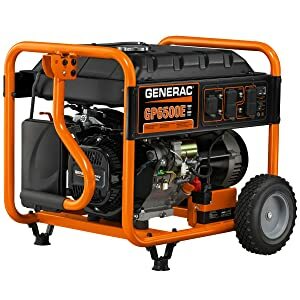 Affordable reliability and features not usually found on basic portable models make these a favorite for home use, camping jobsites or outdoor events. Generac’s GP6500 portable generator provides 6,500 running watts and 8,125 starting watts. That's why these generators are a favorite for home use, camping, job sites, or outdoor events.